I love my black skinny jeans, but I was getting to the point where I was fed up of them fading so much I was buying new ones every 6 months. I decided it was kill or cure: if I were to dye them, it would either ruin them, but I was going to bin them anyway, or it would mend them so I gave it a go... As you can see below it worked really well. 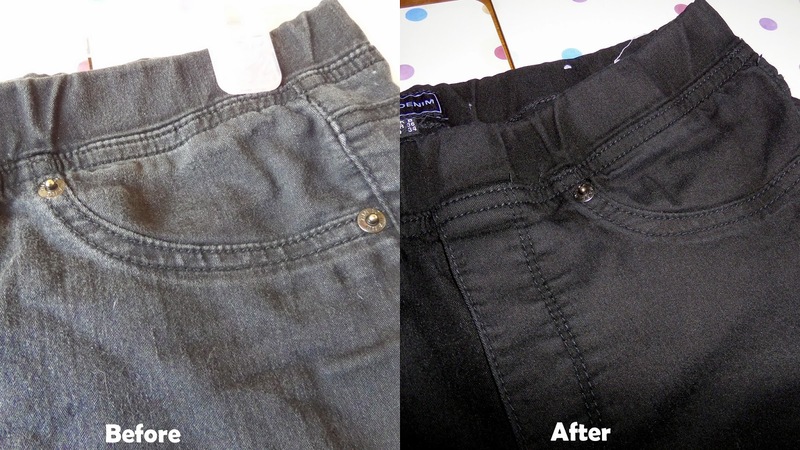 These are my Warehouse black jeggings, but I also dyed some less faded black Topshop Leigh jeans. and put your clothes to dye on top of the pile. Then set your machine to 40 degree cotton wash and go! Once it has finished, you need to put washing liquid in the drawer and wash again at 40 degrees. But after running an empty machine with some more washing liquid in, it was fine. I've even washed a white load since which has come out normal so don't worry about it ruining your machine. Disclaimer - I was sent this product after tweeting some DIYers about their experience using black dye on jeans. I have done this before, it's so good! They also do a denim one. © Lauren Loves Blog | All rights reserved.